Pathok Gebang Beach is located in Jengglungharjo village, Tulungagung, East Java. 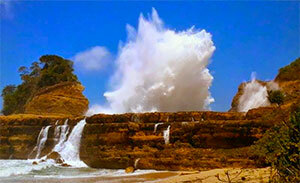 Pathok Gebang is one of genuin beach, for it becomes one of most hidden coastal in Tulungagung. Not only because of the road access that is still inadequate, but also the location is quite remote from residential areas. To get to the site is not easy and challenging. The interesting thing about this beach is when the tide is high, where we can see the waves that hit a reef up to 15-20 meters. All the struggle will be paid upon arrival at the site and enjoy the beauty of the surrounding.